After the aluminum producer was spun out of its corporate parent, since renamed Arconic Inc., Alcoa's shares have skyrocketed. Two of our top contributors offer up reasons you should and shouldn't buy these two companies. What should investors do? We reached out to two of our contributors and asked them to break things down. Here's what they had to say. Jason Hall: Count me among the many people surprised by how far Alcoa's shares have run, and so quickly after being spun out as a pure-play bauxite miner and alumina/aluminum producer. This is particularly astonishing considering that absolutely nothing has happened in the past couple of weeks to support this quick run-up. 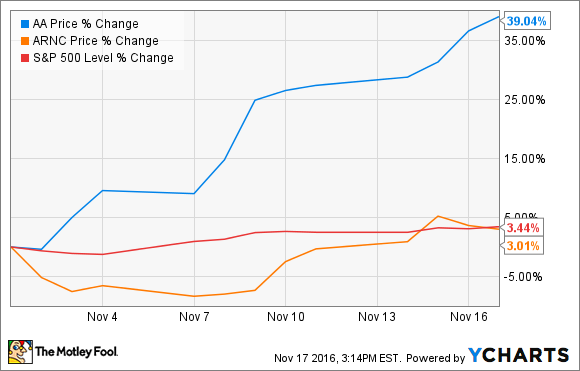 Let's start with the election of Donald Trump to the U.S. presidency, which corresponds with the vast majority of Alcoa's stock gains. The catch? Trump's "Make America Great Again" platform, which is largely pro-American industry, may not offer much value for Alcoa, which actually does very little production in the U.S. The vast majority of the world's bauxite reserves are outside North America, and the primary alumina refining is done near the mines. In other words, some of the potential economic benefits that domestic manufacturers could get under a Trump administration just may not carry over to Alcoa in the same way. Furthermore, as Alcoa is a primary producer of aluminum and its precursor materials, its fortunes are largely tied to commodity prices. There's some potential good news on that front, as global production has been in a deficit in 2016, with demand growth outpacing production. There's a good chance this will lead to higher prices, but so far that hasn't happened. Put it all together, and Alcoa's stock looks like it's gotten ahead of the fundamentals that will drive its results. Arconic, on the other hand, is pretty appealing. Not only -- as Tyler discusses below -- does it seem to be trading for what could be a big discount today, but there's a very strong long-term tailwind that should at the very least support steady profits over the next decade-plus. Demand from the aerospace industry alone could be massive, with Boeing and Airbus having a combined $1.6 trillion order backlog for more than 12,000 aircraft. The caveat? Arconic took on a substantial amount of debt in the spinout of Alcoa, but also retained just under a 20% stake in the aluminum producer. I'd like to see Arconic monetize that Alcoa stake and pay down its debt. Furthermore, I'm of the opinion that until we have a couple of quarters of financial and operating results in, it's not completely clear what the corporate costs will be for these now-stand-alone companies. Between the two, Arconic seems to be the safer bet to be a winning investment from here. But I'd prefer to see a quarter or two of financial and operating results from the stand-alone companies before taking a big stake in either. Alcoa's international mining and refining operations will still be driven by commodity prices. The market may have gotten ahead of this fundamental thing. Image source: Alcoa. Tyler Crowe: I'm not saying that it's a bad idea to buy Alcoa's or Arconic's stock, because there are plenty of reasons to like them both. Alcoa is one of the premier aluminum producers globally, and Arconic has developed an impressive portfolio of high-end manufactured products for the aerospace and automotive industries. Rather, I think the best course of action regarding these stocks is to take a wait-and-see approach until we get a couple of quarters of financial reports from the two companies before making any real investment decisions. I can totally understand why investors might want to get in early, because the market might not realize the value of these stocks. Let's start with Arconic. Today, the company trades at 0.9 times sales and 1.2 times tangible book value. That seems like a steal when you consider that another engineered-product manufacturer -- Precision Castparts -- was bought at a price of 3.3 times sales. That would suggest that the current price of Arconic is undervalued. As tempting as jumping in may sound, it's worth waiting for some issues to resolve. Arconic ended up taking the lion's share of the debt during the split in hopes of breathing new life into the legacy mining and smelting business. This could be a big drag on Arconic for some time, while Alcoa will likely continue to suffer from low commodity prices even with a cleaner balance sheet. But these are all assumptions; until we actually see reported financial results over the next few quarters, there's a lot of guesswork involved that some investors may not be completely comfortable with. Once we get at least a quarter or two of financial results to see how these two separate entities handle being on their own, it's probably best to take a wait-and-see approach.